Any one of the young women I talked to this past week would be a great role model for my 7-year old goddaughter, Melanie. I worry if Melanie will have a strong female athlete role model to look up to. As I've said before, women's athletics doesn't always get their due. Even though the Lynx are the only professional team in Minnesota that has won anything in the past decade, they are not in the same conversation as the Twins, Timberwolves, Vikings, or Wild. Millions of men's brackets are filled out for the NCAA Tournament, but the women's tournament gets no where near the amount of attention. 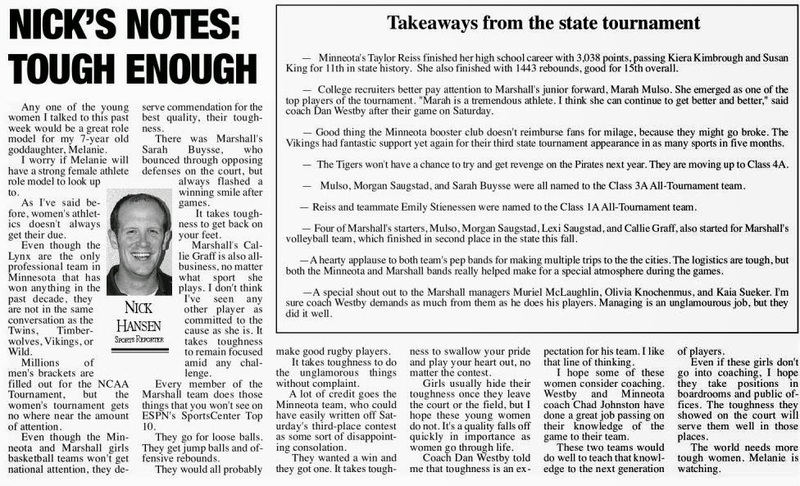 Even though the Minneota and Marshall girls basketball teams won't get national attention, they deserve commendation for the best quality, their toughness. There was Marshall's Sarah Buysse, who bounced through opposing defenses on the court, but always flashed a winning smile after games. It takes toughness to get back on your feet. Marshall's Callie Graff is also all-business, no matter what sport she plays. I don't think I've seen any other player as committed to the cause as she is. It takes toughness to remain focused amid any challenge. Every member of the Marshall team does those things that you won't see on ESPN's SportsCenter Top 10. They go for loose balls. They get jump balls and offensive rebounds. They would all probably make good rugby players. It takes toughness to do the unglamorous things without complaint. A lot of credit goes the Minneota team, who could have easily written off Saturday's third-place contest as some sort of disappointing consolation. They wanted a win and they got one. It takes toughness to swallow your pride and play your heart out, no matter the contest. Girls usually hide their toughness once they leave the court or the field, but I hope these young women do not. It's a quality falls off quickly in importance as women go through life. Coach Dan Westby told me that toughness is an expectation for his team. I like that line of thinking. I hope some of these women consider coaching. Westby and Minneota coach Chad Johnston have done a great job passing on their knowledge of the game to their team. These two teams would do well to teach that knowledge to the next generation of players. Even if these girls don't go into coaching, I hope they take positions in boardrooms and public offices. The toughness they showed on the court will serve them well in those places. The world needs more tough women. Melanie is watching.